ProtoWorks is the Martin Trust Center’s makerspace where students are able to explore and experiment on their entrepreneurial ideas through initial physical prototyping. ProtoWorks builds and supports community across MIT by bridging entrepreneurship and innovation and accelerates learning via experimentation. 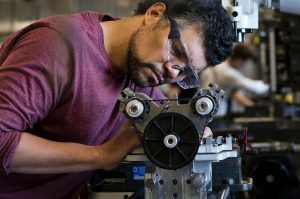 Currently registered MIT students may access the space following a general orientation, after which they may take advanced trainings to gain access to our 3D printing, laser cutting, and bench tools. Sign up for trainings here. soldering irons, electronics components such as breadboards, Arduinos, etc. Visit the ProtoWorks website or email protoworks@mit.edu for more information. You may always check to see if ProtoWorks is open on the Mobius app. Download it here.